You’ve also probably used countless cleaning products, all to come to one conclusion: a dirty oven. What if we could provide a solution? What if we told you there’s an excellent homemade oven cleaner without baking soda out there that you can make on your own? Finding a homemade oven cleaner recipe that doesn’t involve a lot of time or effort may seem complicated, especially if you’re trying to avoid the use of harsh chemicals. However, DIY natural oven cleaner recipes with lemon, dish soap, white vinegar, and essential oils will have you self-cleaning in no time. Some oven cleaning methods take a little bit of time and effort, and others don’t require as much. With as little as two ingredients, you’ll be maximizing your time and getting the job done the right way. Stir the ingredients in a pan and start heating over the stove until thickened. Allow the solution to cool to room temperature. Apply the mixture to the oven door and the inside of the oven and allow it to sit for approximately 20 minutes. Take a paper towel and wipe down all the areas you applied the cleaner. If you’re trying to get that lemony-fresh smell in and around your oven, you might want to pick up some lemon juice at the store. Stir the lemon juice and cornstarch in a pan over medium heat until the liquid thickens. Bring the mixture to room temperature and stir in the dish soap. Spritz the inside of the oven using a spray bottle, and allow it to sit for approximately 20 minutes. Wipe down the areas you’ve sprayed. Some cleaning recipes are better for removing dirt, and some cleaning recipes are better for eliminating grease build-up. Either way, using rubbing alcohol in a homemade oven cleaner without baking soda is the way to go, especially when trying to make an all natural stainless steel cleaning solution. Stir all ingredients in a pan and pour the solution into a spray bottle. Spray and let the mixture sit on the surfaces for approximately twenty minutes and then wipe. The most affordable cleaning recipe you can follow is one based off ingredients you will most certainly already have on hand. Start by preheating your oven to one hundred and twenty-five degrees. Once the temperature has been reached, take warm water or white vinegar in a spray bottle and spray all surfaces of the inside of the oven. Next, sprinkle salt on all areas that are stained or filled with grime and allow both the mixture and salt to sit until the oven has cooled down. Once cool, wipe the oven. The best way to clean oven and stove regularly is to grab some tin foil and rub it up and down the grills of the oven racks. If you want to be extra careful, and if you don’t want to have to clean your oven all the time after cooking, place tin foil under any dishes you cook within the oven, as this will catch most of the grease leaking from the pans or casserole dishes. If you want to crunch down on cleaning time, this is the way to go. Finding the best self-cleaning oven tips and tricks may be a challenge, but with our carefully thought out advice, you’ll have a clean oven in no time. Not only will our recipes get out that hard to reach build-up, but they’ll also clean all oven racks and every oven surface. 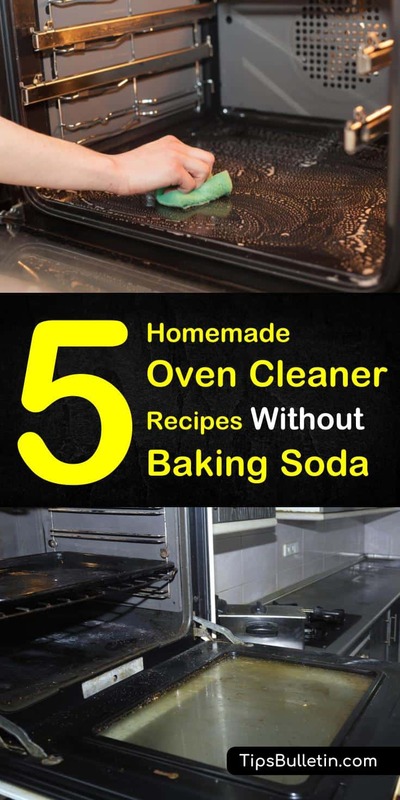 Don’t be scared to put down the baking soda paste and start embracing all other oven cleaner recipe options with our hand to guide you. 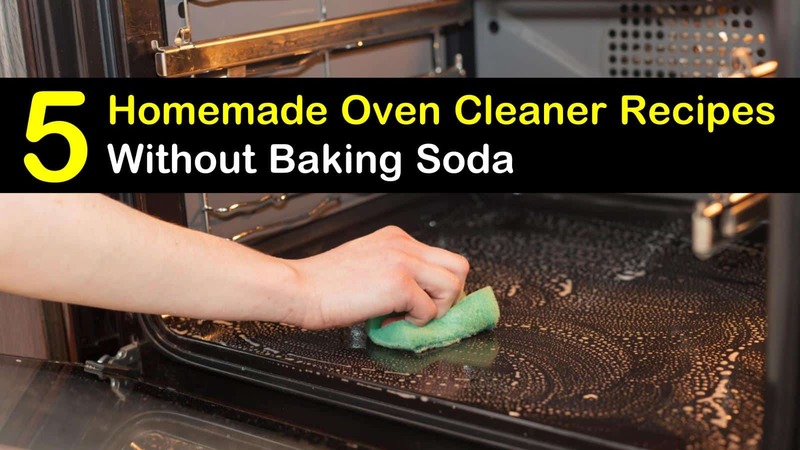 We hope you enjoyed our homemade oven cleaner without baking soda recipes and tips. If you enjoyed reading our article, please share our oven cleaning tricks on Facebook and Pinterest with your friends and family.